The Lake Erie Monster #2 is coming! 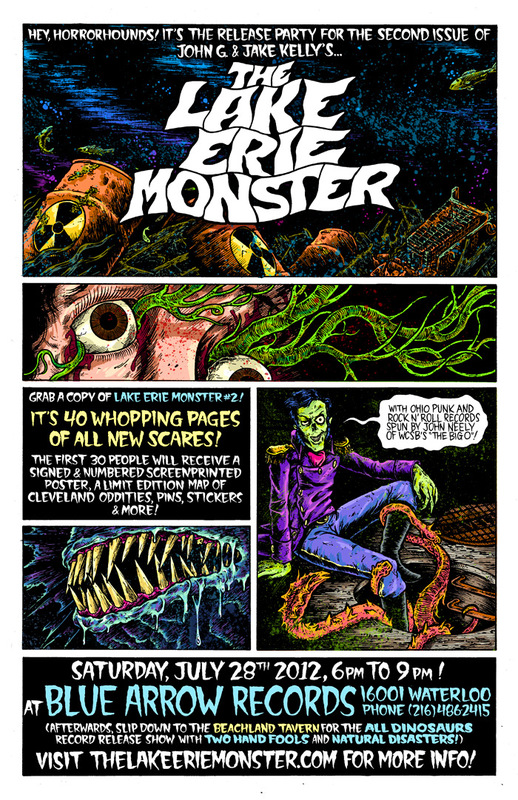 The highly anticipated and much feared second issue of Cleveland’s horror anthology comic, The Lake Erie Monster, is coming! The release party is at Blue Arrow Records (16001 Waterloo Rd) on Saturday, July 28th from 6pm to 9pm! J. Kelly and John G have raised the stakes with their sophomore issue by adding pages and upping the print run, after the first issue SOLD OUT in just over one month! In this issue we continue the gruesome flagship tale with Part 2 of The Lake Erie Monster “movie adaptation” as written by J. Kelly and illustrated by John G. We also have J. Kelly’s terrifying take on the violence of vegetation with our back-up story GREENS. Of course you’ll find another of The Commodore’s Cleveland pages, along with slightly even more artful and zany ads for your favorite local small businesses (often remarked on as a favorite part of the comic)! Keep your attention focused on this website here for previews and updates as the clock ticks down to July 28th, 2012! There will be a exclusive limited edition signed and numbered screen print, exquisitely printed by friend of The Commodore Kate Tobin, available for the first 30 people who buy the comic. Also available will be a free Map of Cleveland Oddities, pins, stickers, and more! John Neely, of WCSB’s “The Big O” will return to the turntables to spin only the finest and most revered of Ohio’s own rock n’ roll records. This release is happening in tandem with the release of Cleveland’s Rock Destroyers ALL DINOSAURS‘ sophomore full length LP, The Rules of Civility and Decent Behavior! 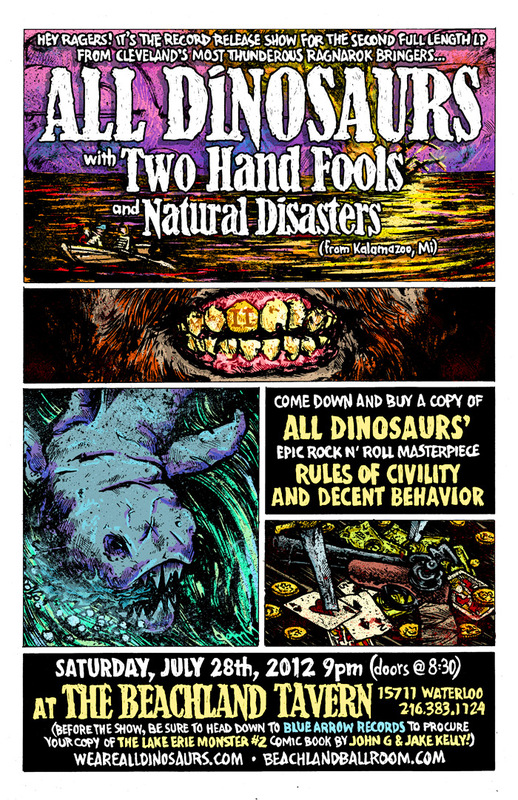 The band will be playing a release show at The Beachland Tavern with friends and local punk heroes Two Hand Fools, and Natural Disasters (From Kalamazoo, Mi)! Not only have we heard The Rules of Civility and Decent Behavior, but we’ve have had it absolutely cranked in The Volcano as we’ve been grinding away on The Lake Erie Monster #2 and other mysterious occult projects. You need to own this record! The best way to ensure that you get yourself a copy is to PRE-ORDER it through ALL DINOSAURS’ Kickstarter project page, where there’s multitudes of incentive options from just ordering the digital release ($5), to having the band come play wherever you want ($300). In particular, at the $25 pledge and up, you will get both Paranoid Indigenous (All Dinosaurs’ first record), The Rules of Civility and Decent Beghavior, and an exclusive limited edition print by The Lake Erie Monster’s own John G. Additionally, at the $150 pledge, which there are 2 options for, you will receive one of John G’s original drawings either for the poster for the show of the video premier for “Castle of Uncle Robert” or the poster for Paranoid Indigenous! Please see the post on John G’s blog for further info about that and images of the art!